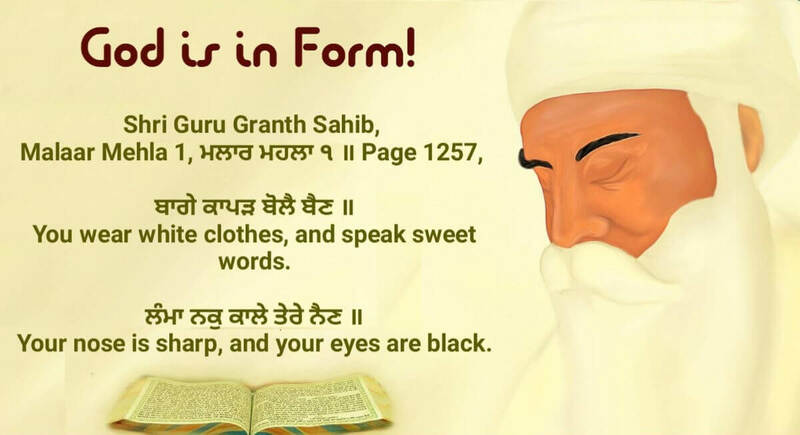 Guru Nanak Dev Ji has described the form of God in Shri Guru Granth Sahib. Guru Nanak Dev ji has described the features of that Supreme God after he saw Him sitting on a throne in Sachkhand. You wear white clothes, and speak sweet words. Your nose is sharp, and your eyes are black. I fly and soar, and ascend to the heavens. by Your power, O my All-powerful Lord and Master. He gave it great thirst and desire to fly. When He bestows His Glance of Grace, I am comforted and consoled. Neither this body, nor its wings, shall go to the world hereafter. It is a fusion of air, water and fire. O Nanak, if it is in the mortal's karma, then he meditates on the Lord, with the Guru as his Spiritual Teacher.